•	Landscape Connectivity: The whole sweep of forest provides an essential wildlife corridor at the neck of the Chebucto Peninsula, north to the Sackville River and the mainland — an important link to be preserved by the Green Network Plan. Endangered mainland moose have traditionally inhabited the area, and they continue to be sighted. The Nova Scotia Department of Natural Resources considers the proposed Sandy Lake Regional Park as “important mainland moose habitat”. 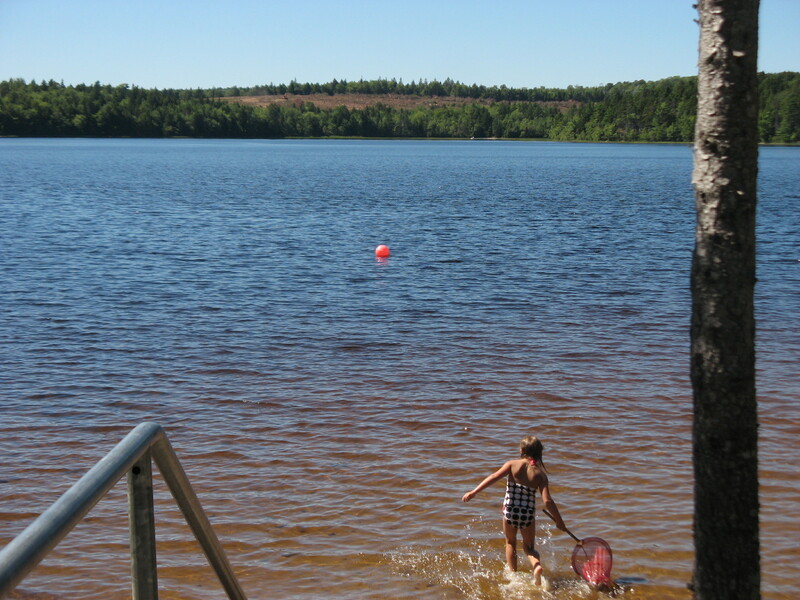 •	Recreational Trails: The area proposed for Sandy Lake Regional Park is already used unofficially by citizens of HRM for multi-recreational purposes through a network of existing trails. Currently, a wide variety of outdoor activities are conducted on these lands, including mountain biking, birdwatching, swimming, paddling, fishing, dog-walking, cross-country skiing and snowshoeing, to name a few; the power lines are popular corridors for ATVs. There are wonderful opportunities for ‘forest bathing’ amidst old growth and along hemlock lined sections of Peverill’s Brook. •	The Sandy Lake watershed is the largest sub-watershed of the Sackville River and hosts populations of seagoing American eel, Atlantic salmon, Gaspereau and speckled trout. The integrity of this system is critical to the Sackville Rivers Association’s efforts to revive salmon in the Sackville River system. •	Increasing the park size would also protect the Sackville River flood plain help reduce risk of flooding in Bedford through the retention of naturalized areas, groundwater recharge, and wetland protection. •	The wetlands bordering Sandy Lake and Marsh Lake and along much of Peverill’s Brook leading to the Sackville River host a complex, healthy ecosystem that includes large populations of amphibians and reptiles. •	The diverse wildlife population includes over 100 species from the mighty osprey to the tiny ruby-throated hummingbird. Loons, otters, frogs and snapping turtles inhabit the lakes and the woodlands are home to bobcats, barred owls, many warblers, wood turtles, deer, ermine, fox and mink. •	The proposed park area hosts endangered flora including the wavy leaved aster (Symphyotrichum) and the Greenland stitchwort (Minuartia groenlandica), orchids and ladyslippers. •	Sandy and Marsh lakes are bordered by rich drumlins that support magnificent mixed, multi-aged Acadian forest with significant old-growth stands, some trees over 200 years old, and striking “pit and mound” topography. •	Sandy Lake provides an exceptional outdoor laboratory for education and is a popular location for education and research for schools, universities and community. With so many schools nearby, the expanded park would be an ideal area for increased exposure to nature. “In the case of schools such a location would facilitate outdoor science and field trips.” P.23 Dean Report. •	Aquatic studies point to deterioration in oxygenation and increased salt loading of Sandy Lake since the 1970s, related to urbanization and some clearcutting. Significant further settlement within the Sandy Lake watershed would make the lake inhospitable to the migratory fish, reduce wildlife diversity, as well as increase flooding downstream. The Sandy Lake Regional Park would guard Bedford from increased flooding by protecting the Sackville River flood plain. •	The Sackville River Conservation Corridor was identified in the Halifax Active Transportation Plan as a priority link to connect Fort Sackville, Bedford, along the Sackville River Valley to Uniacke House in Mount Uniacke and connecting to Hammonds Plains and the Regional Park. •	Bedford Lions Club Beach, already within the park boundary, will be enhanced by the expansion by maintaining water quality and view planes. The development proposed for the west side of the lake will include a drumlin (hill) that if built upon would ruin the lake’s forested view plane from everywhere on the shore of the larger part of Sandy lake, and notably, is directly visible across the lake from the Bedford Lions Club Beach.